PROFESSOR COLIN BRISTOW FOR OUTSTANDING SERVICES TO OUR GEOLOGICAL KNOWLEDGE. THE ROYAL GEOLOGICAL SOCIETY OF CORNWALL THE OLDEST GEOLOGICAL SOCIETY WITH THE LONGEST RUN OF PUBLISHED GEOLOGICAL PAPERS AND TRANSACTIONS IN THE WORLD CELEBRATED AT THEIR BICENTENNIAL DINNER WHICH WAS HELD AT THE UNION HOTEL, PENZANCE. The event at UNION HOTEL was the same Hotel, on the same day, exactly 200 years ago that the Society was formed. 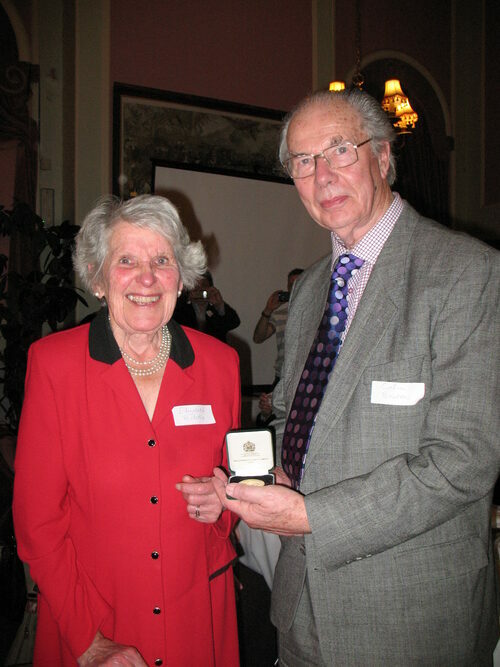 To mark the special occasion the William Bolitho Gold Medal was awarded to Professor Colin Bristow the highest award that the Society can grant. Colin is well known to us all. He read Geology at the University of Bristol and graduated in 1957 spending his early career in Kenya as a water supply geologist and formed the first Geological Society of Kenya. On his return to the UK he gained his M. Sc at Exeter University and in 1962 joined English China Clays and for 30 years developed Cornish China Clay as a major product exported all over the World. He retired as Chief Geologist. In 1988 he became visiting Professor in Industrial Geology at the Camborne School of Mines. In 1993 he was awarded the Hal Williams Harding Award from the American Institute of Mining,Metallurgy and Petroleum Engineers,(AIME). He continued as consultant to ECC and has written over 70 technical papers concerning the genesis and classification of Kaolin Deposits and the economic aspects of World Kaolin. During his career Colin has made a significant contribution to the understanding of Cornish Geology and continues to do so as an author and a lecturer. The Trustees of the RGSC unanimously awarded the William Bolitho Gold Medal for his outstanding contributions to geological knowledge and research and development of industrial resources worldwide but particularly in Kaolin and Ball Clays,but most particularly in the Cornish Peninsula.